Spinal Injuries Association (SIA) is the leading national user-led spinal cord injuries charity. We are governed by a trustee board made up of a diverse group of spinal cord injured (SCI) people elected by our members. Feedback from our members helps us to shape and develop our services and support. Our belief is that everyone has a right to live a fulfilled life and that means the life that they choose, a life that has the same opportunities as everyone else. These beliefs have informed the development of our strategic plan. 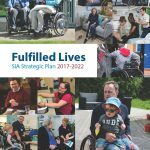 Download a copy of our strategic plan to find out more about the objectives that will shape our future over the next five years.